Celebrating all of the little holidays throughout the year is too much fun. I’m a total sucker for super cute and quirky ideas. Valentine’s Day just passed and not it’s time to get our St. Patrick’s Day celebration planning under way. 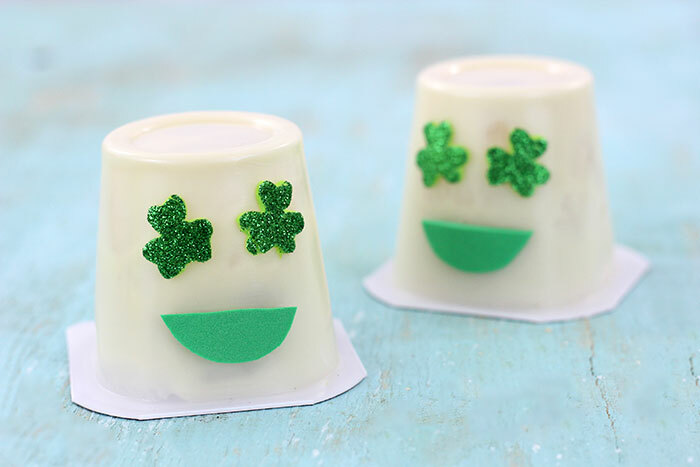 If you’re looking for a cute treat to serve at parties or something to send the kids to school with, these Shamrock Emoji Pudding Cups are perfect for that. This post contains affiliate links. 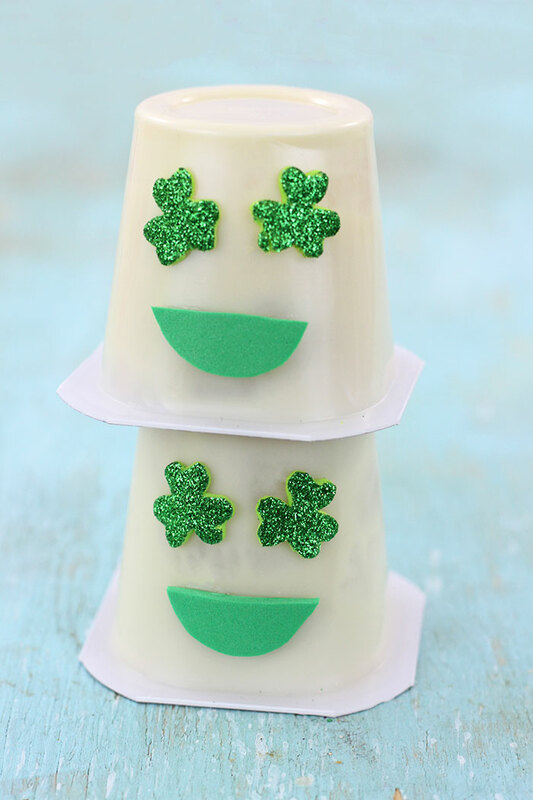 A few weeks ago, I shared these emoji pudding cups and thought it would be fun to put a St. Patty’s Day twist on them. One of my all time favorite emojis is the heart eyes emoji, so shamrock eyes seemed like an extra cute win too. Trimming the shamrocks can be a challenge due to the size and shape. Here’s the best way that I found to do this. Print out the shamrock printable above. Trim a single shamrock out. Tape it to the back side of a small piece of your green glitter foam that’s just slightly larger than the single shamrock print out. This will help keep it in place so that nothing shifts while you’re trying to cut. The other important thing that will make this so much easier is to use a small pair of sharp scissors (not children’s scissors). These two things will make trimming out the shamrocks SO much easier. 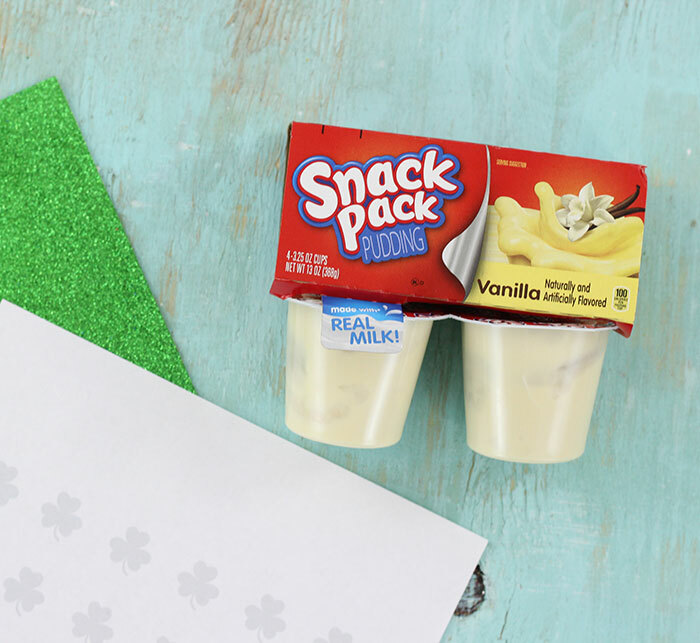 If you use the shamrock printable, these are the perfect size. You can also use something else to trace them. If you do, tt will be easiest to sketch the desired shapes and then cut them out with scissors. To make the mouth, I chose regular green foam for a little contrast. 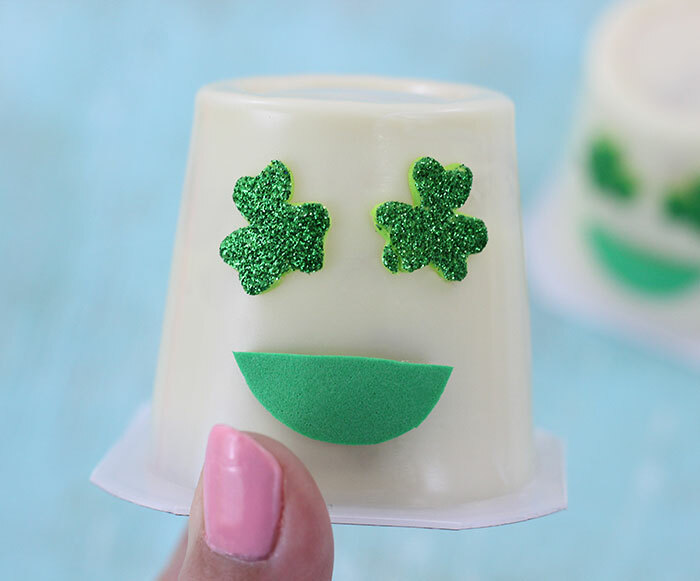 Once you’re done cutting out your shamrock eyes and mouth, you can stick them on if your foam has the built in sticky foam or use a non-toxic glue to stick them in place. Once they are dry! You’re ready to spread that St. Patrick’s Day love to all of your friends. I’m hopping around with some of my blog friends to share some St. Paddy’s Day Luck! Make sure to visit them for more cool themed DIY. These are so fun and easy for little hands to make!